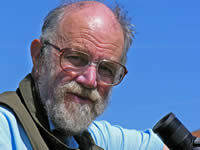 The death of Bob Scott in April was a great loss to the conservation world, and a personal loss of a great friend. I first met Bob as a fourteen year-old birdwatcher on Beddington Sewage Farm in South London. The Sewage Farm was a breeding ground for conservationists and biologists of the future, and I am still in touch with at least 8 of them. Bob worked at the Natural History Museum, but was soon to leave and become Warden of Dungeness Bird Observatory and the RSPB's Dungeness Reserve. From then on there was no stopping Bob's enthusiasm, and he rose to be Head of Reserves for the RSPB. And from its earliest days Bob was a supporter of the World Land Trust, promoting it whenever he could. Detailed obituaries appeared in The Times and many other places, but I will always remember Bob for his (merciless) sense of humour, combined with unbounded enthusiasm for birds, wildlife and their conservation. For the sake of posterity, I would mention that although The Times obit stated that he developed an interest in moths late in life, I recall going 'mothing' with Bob and others back in the days when he was warden of Dungeness, which was over 40 years ago. Like Bob, I used to cycle there from London as a teenager for weekends (80 miles each way I think), and vividly recall Bob's beer-drinking pet crow that used to accompany him when he worked in the local pub in the evenings (Observatory Warden's pay was notoriously low in those days). More recently, every year I would catch up with him at the BirdFair, and a couple of years ago, quite by chance while staying at the Iguazu Falls hotel in Argentina, I was astounded to hear a strident shout across the hall, as Bob spotted me. He had retired from the RSPB, but was on holiday with his wife Ann and some friends, enthusing even more people as he went along. And one thing Bob probably did better than anyone else I have known (other than enthuse) was to cut through bureaucracy, and get things done. As a memorial to Bob many of his friends and family have donated to the World Land Trust, and the funds are to be used towards our new land land purchase in Misiones, Argentina, close to the Iguazu Falls. You can donate to the Bob Scott Memorial Forest here.